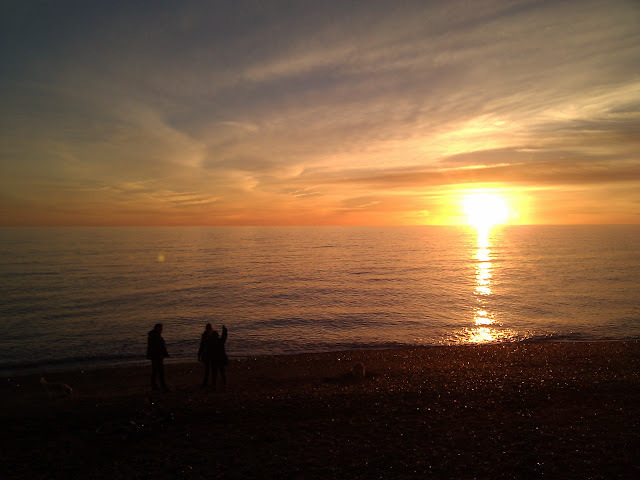 Today I expanded the horizons of how much I have seen of the English coast, and it was all pretty lovely. 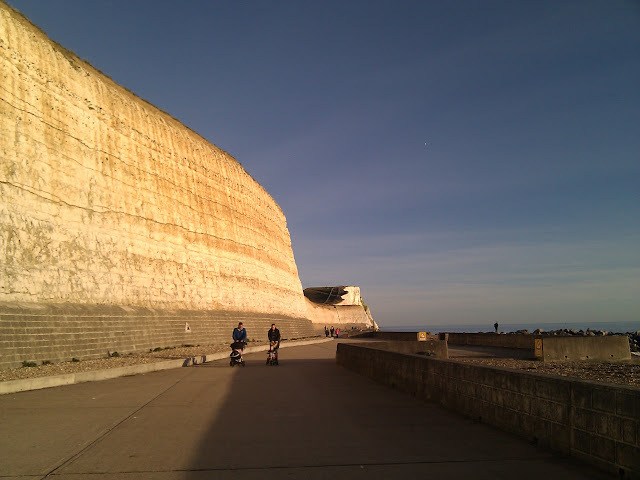 First, (and non-horizon-expanding, really) Jon and I took a long walk along the seafront this morning, taking advantage of the beautiful sunshine and not too chilly temperatures that we seem to be having this mid-November. 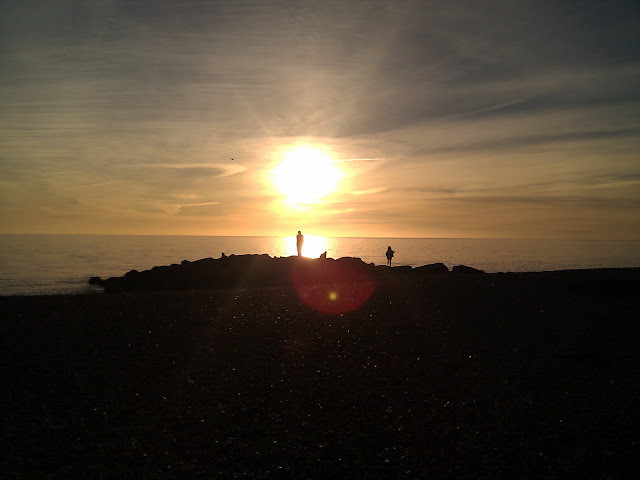 It was another one of those days where everyone in Brighton was out! The sunshine just does that to people-all the kids, dogs, and athletes, running amuck, soaking up that Vitamin D. While we were out and about, Jon’s parents called and asked if we wanted to hang out, and, of course, we said yes (okay, I’m pretty sure they weren’t like “hey Jon, you guys wanna hang out with us today?” but you know what I mean). So at 2 o’clock we piled into a car full of dogs and people and decided to head east out of Brighton, where I’ve never been before. It was gorgeous! 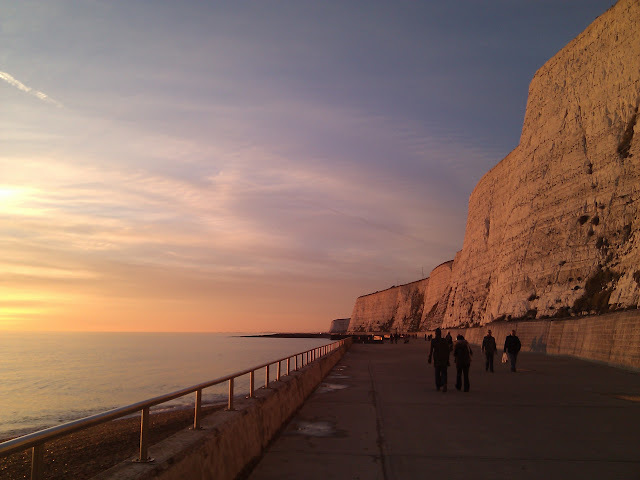 These are the chalk cliffs that run along the coast of East Sussex. 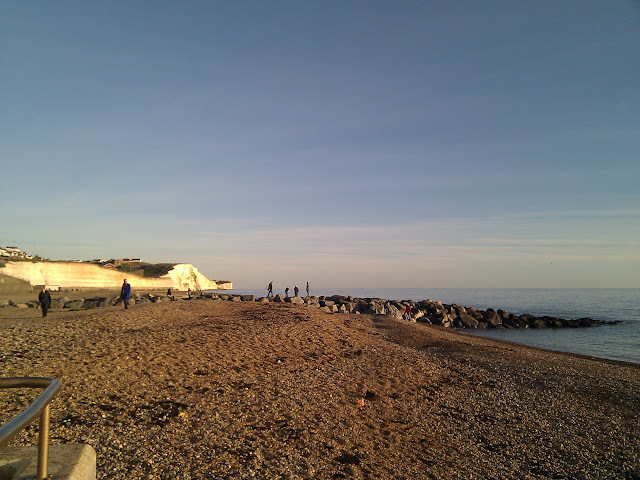 We parked the car in Saltdean and walked up to Rottingdean. Over there it was far less busy than what I’m used to right along the sea in Brighton, near us. There’s less beach, fewer people, and more water- and I loved the cliffs. I still haven’t managed to see the white cliffs of Dover that I’ve heard so much about, but I imagine in my mind that these are pretty close! 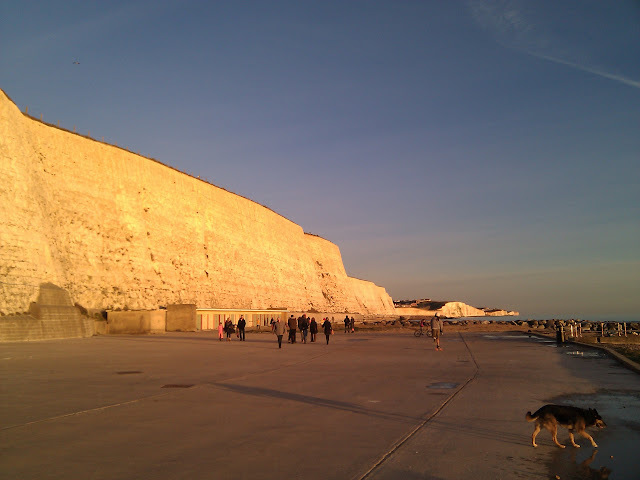 (Plus I’ve heard that you can’t really see much of the Dover cliffs unless you’re actually out to sea). This was also my introduction to a “lido”, which I’m fairly certain is an English creation. Lidos are outdoor pools filled with seawater, close to the beach, but not on the beach. 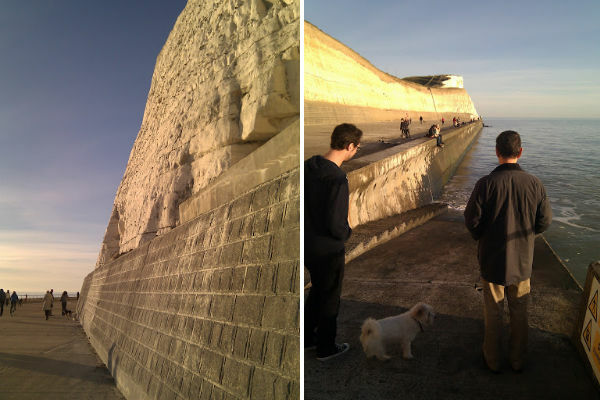 Apparently Saltdean’s lido is fairly well known for its architectural and historical importance. It’s in the Art-Deco style and looked just like every other outdoor American swimming pool I’ve ever seen, but what do I know? I like the idea though. Very sustainable! I want to go here all the time. So pretty. The Earth is a magical place. My guy. He’s a gem, and we both need haircuts something fierce. The sunset tonight was amazing. Even though the sun set before 4:30, and I don’t like that at all….it was an amazing sky full of purples and pinks and shades of blue. The whole day was so nice-I feel really lucky when we get days that are both full of sunshine and lacking in clouds (not really England’s forte, as you may have heard). 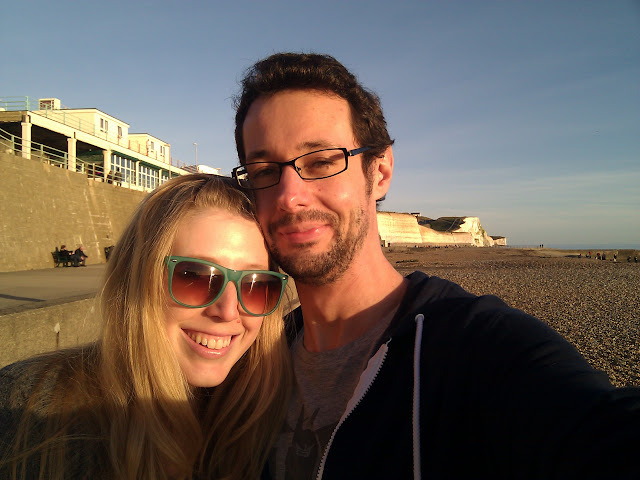 It was a perfect day to be out and about, and after our long walk the four of us had a drink and some dinner at a pub in the Brighton Marina, which is very sterile and almost similar to Easton in its shopping center-ness, but very nice, nonetheless. I came home and got to skype with some people I love. It was a successful Sunday. when did you try? i didn’t see you on there! love you too!